This was an interesting year. In 2014, I saw 127 games during the high school football season. Which was 27 more than I had ever seen in a single season. Since then, my goal has been seeing games in new places, rather than just going for the most I could see. Last year saw new trips to South Dakota and Minnesota. This year, the plan included a few new places. In addition to games at Ball State and Tennessee Tech, I happened to find state title games in North Carolina. As with previous recaps, this is a breakdown of my travels. I attended games games in 11 different states. No new states this year. Of the 19 weekends, I attended games each weekend. 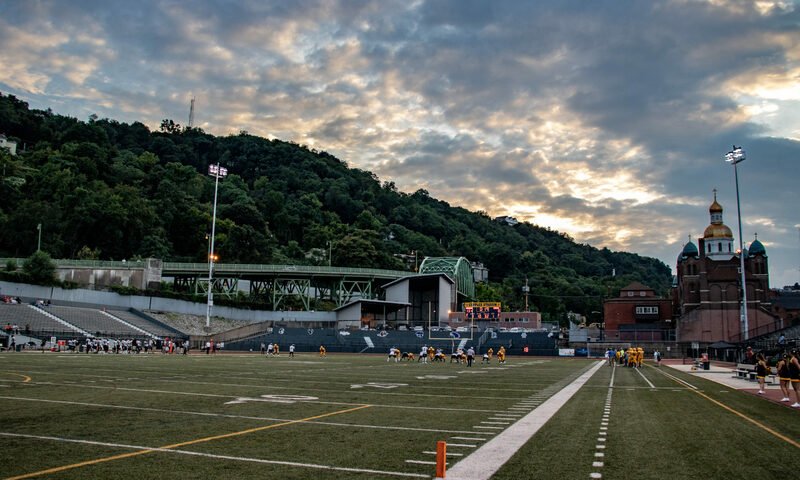 My first game was on August 16th in Chattanooga, Tennessee. And the season ended on December 22nd in Arlington, Texas. I attended games in 59 different stadiums in 56 different cities or towns. I saw 220* different teams this season. 119 of them for the first time. Overall, that brought my lifetime total up to 1,061 different teams. *-I’m not sure where I messed up my count, but I had reported previously on my running tally as 203 different teams. Somewhere a couple of weekends weren’t tallied and not sure how I missed that. Oh well. Everything else I’ve double-tripe-confirmed. 1,061 different teams lifetime, and 940 games. For lifetime totals, I’ve now seen 1,061 different teams play. 300 different stadiums in 270 different cities or towns. In games I’ve attended, there were 6,141 total points scored, for an average of 52.04 points per game (a 2.82/game less than last year). The cumulative score was 4381-1760, for an average score of 37.13 to 14.92. Compared to the 38.686-16.174 from last year. There were 15 shutouts this season and the most points were 100 scored by McLean (TX) in a 6-man championship game in Texas. The most for an 11-man game was 80 by Pittsburgh Imani Christian over Richard Wright Charter (DC) at Woodland Hills’ Wolvarena. Every year, I try to guage the various states by games that I’ve seen. Considering what ‘level’ those games are. I’m not going to put up a state championship game against a matchup of two winless teams, but understand where those two games fall among that state’s heirarchy. After not counting North Carolina last year because the game was an outlier, the state finals solidified their spot. Their state title games, despite rain, were abysmal. I’m sure regular season attendance might jump that up. But, I checked previous years attendance at title games and wasn’t impressed. At the top, Texas is a lock at #1. Over 48k for the 6AD2 game. Over 42k for the 6AD1. 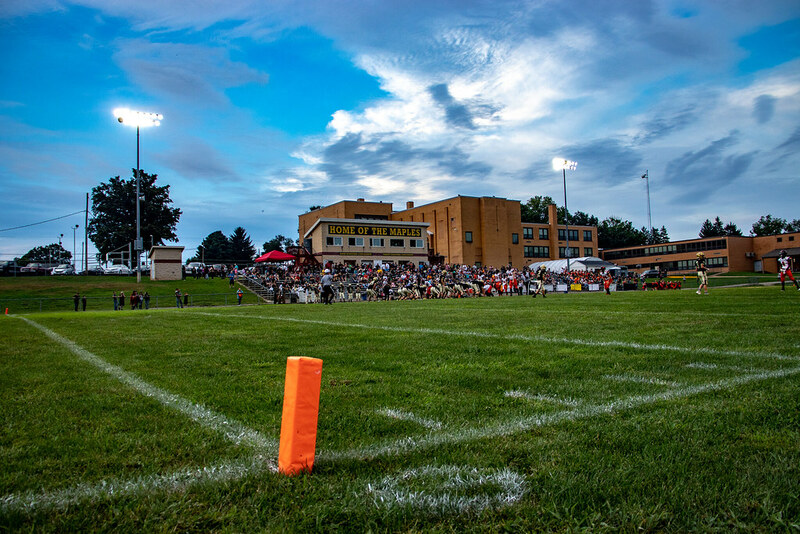 Even the small six-man games had more fans attend than most PA title games. Ohio alway has decent attendance. Much more noticeable at the smaller towns. Iowa gets high marks and was always a state that still sees HS Football as the Friday Night thing to do. The semifinals means a lot of travel for 24 teams. And for 12 of them, making the very same trip the next week. So, the showing is always impressive given the issues. Plus the games are televised to most of the state. From 4 to 8, the attendances are middling. Some good, some bad. Tennessee private schools, Division II, were really poor. Surprisingly poor. Public schools, including 1A featuring Cornersville and Whitwell had huge crowds despite the rain and wind. Kentucky was just early season, while Maryland and Indiana had great regular season attendance for the games I attended at a home site, but Indiana’s four games on Saturday at Ball State lacked some of the enthusiasm of its fans. Pennsylvania always has decent crowds among the small home games around western PA. But, Heinz Field has basically zapped the crowds. TV and discomfort attending games has meant small crowds. And mid-December state finals in Hershey with live television on PCN means some very small crowds. North Carolina was mentioned, and lastly is New York. I’ve enjoyed my time in New York this year. Crowds, though, are just smaller on average. The crowds are just as into it as anywhere else I’ve been. Just tend to be smaller. The biggest surprise is CSP’s home game and how well they traveled to both their sectional and state championships games. Bigger schools, like West Seneca West againt crosstown rival West Seneca East at New Era Field were just lacking.. Though weather affected that. Elsewhere, though, games such as in Buffalo, East Aurora, and consolation games are abysmal attendance despite the ticket prices being either free or negligible. There’s a lot of possible and probable reasons. But it’s just a simple reality. This is usually fairly consistent over the years. And just the eyeball test I do every year tends to follow suit. Without seeing California, Florida, or Georgia, Texas for me is the clear winner. It’s been that way for a while. Ohio is usually always a close second. Pennsylvania has some great talent, but it’s split up inconsistently throughout the state and teams. Then, to me, it’s a matter of the midwest being better than the south. The south has better individual players. And the speed of the teams is unreal. 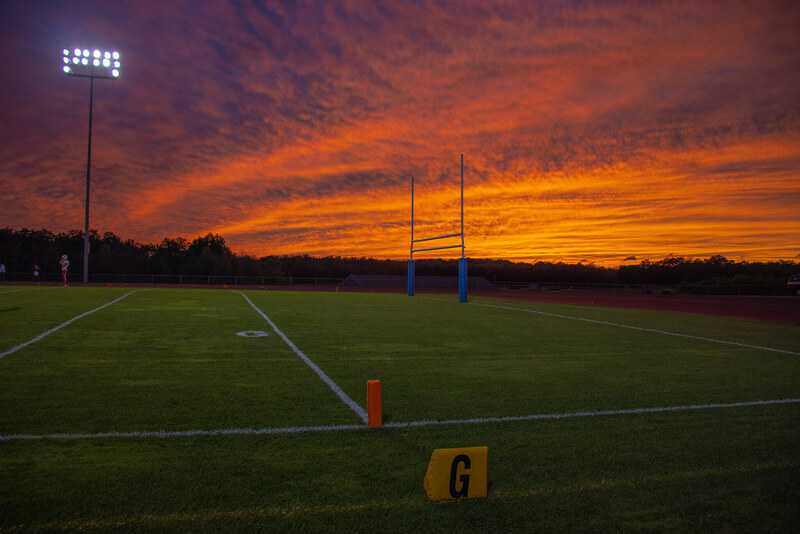 But, for playing football, some of the most fundamentally sound football you’ll find is the further midwest you go. Iowa, Nebraska, South Dakota, etc, might not be known for producing D1 talent, but their teams play as a team. Physical, smart, with proper form and tackling. 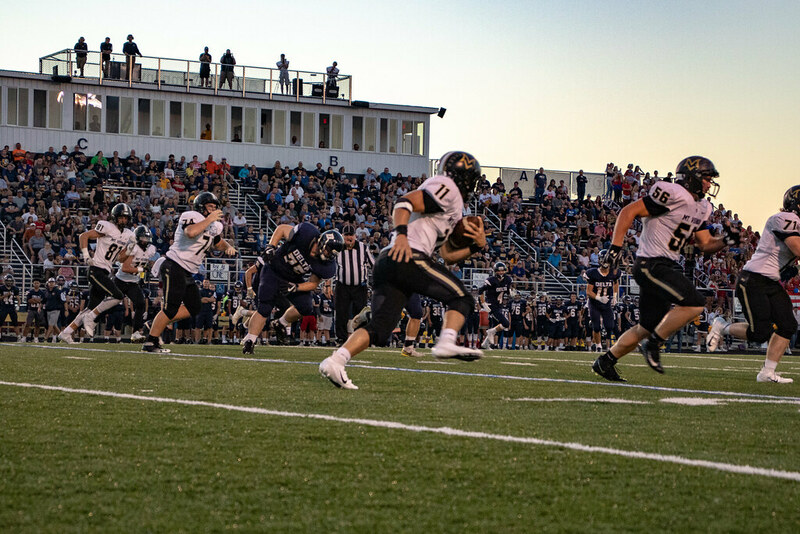 The southeast teams tend to be much more about speed and ‘keep away’, while in the midwest it’s much more about just running over or through your opponent. I’ll try to base this on cost, even in events I got in free. But, weather is a factor. So, it’s not a surprise that a dome factors heavily into the first two choices. Now, Iowa over Texas. This might surprise people. And I’m not basing this just on the games. Texas gets a knock because it’s 4 days instead of 3 for twelve games. As a fan, it’s just a tad cheaper. And despite how cool it is to see such huge crowds in Texas, getting in and out of the stadium is a perk to me. And the games are fun. At AT&T Stadium, the seating down low and poor due to angle, but mezzanine means much further off the field. Iowa has just one seating deck, and first row is about 10 feet above the field, in line with the sideline. Plus, the time works out better for four games in a day. Due to crowd and logistics, it’s impossible for Texas to pull that off. When they had four games on Thursday, it was brutal because games never started on time, and the crowds overlapped more. Ball State, however, was just because how well they treated their fans and the games varied in matchups. Saw a 70-52 game, and a 58-0 game. But, the weather was perfect. The stadium is nice and the high press box results in great shade early on in the day. Food options were limited. But, for a one-day event, it was good. The Tennessee Finals were held at Tennessee Tech’s Tucker Stadium, and was great. Except the horrendous weather. I’d actually put it higher. Attendance was okay. The best crowd of the weekend was the 1A matchup that ended 7-6 in a brutal wind. Pennsylvania Finals get docked for being over three days instead of two. But, having the break in between has always made the games have a more laid back feel to them. Crowds are lacking. New York finals suffer like PA. Small crowds kills a bit of the excitement. But the dome helps tremendously. Only five games is a bummer. But, having the three on Friday and two on Saturday afternoon, means that the games are over around 6pm. Plenty of time to drive home for me. I’ve been to the Carrier Dome many times, so everything about the weekend is fairly easy to handle. The Death Valley Bowl is alays fun in Stanford, Kentucky. This is my fourth straight year going to them. Great setup, support, and crew running the games. Games sometimes don’t live up to the surrounding environment. Stadium is great. Free programs, parking, etc. Great food. The next two are both games at NFL stadiums. The only edge to Heinz Field is the weather. Four games in one day. While New Era Field wasn’t bad, except the rain was horrific. Cold rain on Thursday. Friday was better. But still the threat of rain throughout the day. But honestly not much of a difference. Heinz Field is just one day. New Era Field is 2 days for the extra game. Roy Kidd Bowl isn’t much different than the Death Valley Bowl. A doubleheader in the evening in Kentucky. But the field turf was like standing on a frying pan. And then the rain came. So it went from blazing hot to muggy hot even after the rain subsided. The Western PA v. Everyone Else was just poor matchups and I’m not enthralled by the Wolvarena as some are. Ever since getting listed by Maxpreps’ “10 stadiums to see” list, it’s a ‘must see’. But, I’ve been there before. It’s not bad. Especially the upgrades recently with field turf and better fieldhouse setup. But, the matchups. 80-6, 48-0, both with 6-minute quarters in the second half. Lastly, is the doubleheader in Chattanooga. it was the second time at Finley Stadium for me. Nothing really special about the event. It’s a doubleheader. But the stadium just seems to dwarf the crowd. It’s southeast Tennessee in mid-August. The lightning delay was aggravating, followed by the rainstorm. There was little space to hang out under the stadium that didn’t result in succombing to the oppressive heat. Only standing in the enclosed atrium where there was a small opening from outside meant the air channeled through. And that was it. And lastly was North Carolina. Both their games at UNC and NC State. $15 tickets, even for one game. No presale discounts. Parking was $10 and abysmal. UNC meant parking several blocks away in a parking garage. NC State had on-site parking, but limited to only a small portion of the parking because a major event was taking place at PNC Arena that shares the lot. The rain made it worst. But the crowds were super small. And the state splits their games up to three sites. So the most you can possibly see is 4 games in a weekend. And NC State’s Carter-Finley Stadium leaks. Despite there being a significant overhang to sit under and stay dry, a lot of water still dripped down all over. It took a lot to narrow this down to only five games. Until halftime of the final game, the best game of the season was easily Dowling Catholic-Bettendorf. A 17-0 halftime lead for Bettendorf, Dowling Catholic coming back to tie it. Then with the ball and a crack at a field goal late but a well conceived trick to forced Dowling Catholic to waste their last time out made the last push to win it result in overtime. And then, scoring field goals in OT, and trading touchdowns the rest of the way. Until Bettendorf was stopped on fourth down at the one inch line. But then North Shore-Duncanville happened. Wow. Only way to end the season was the back-and-forth and then the hail mary at the end to win it for North Shore. Elsewhere, an odd selection is Iroquois-JFK. A consolation game on a Thursday afternoon without lights late in the season. A long injury delay threatened the game’s finished. So, the second half was played with a running clock. And yet, at the end it looked like a tie might be possible. The setting sun had long cleared the horizon. And in the twilight, JFK scored to tie the game. And then, with so little time remaining with the running clock, Iroquois scored to take the lead and hang on after the kickoff with no time outs remaining. The other two games were Ridgway’s comeback from being down 7-0 in the fourth quarter. Scoring with less than a minute left to win their playoff game and the District 9 Class AA Championship. 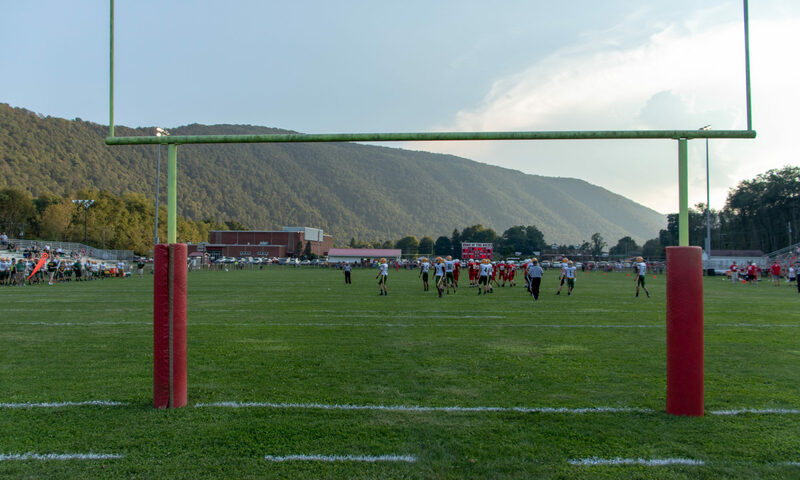 And in the Tennessee Class 1A Championship, Cornersville scored a touchdown in a fierce windy day, but were faced with a fourth down deep in the shadow of their own goalposts. They opted to punt, into the wind, and was barely advanced. A few plays later, Whitwell scored to take the 7-6 lead. A lead they’d hold the rest of the game. But, because of the wind, the score, and how Whitwell won, it’s definitely one to remember. These were the worst of the worst. And these aren’t the top choices just because of what happened in the game. Otherwise, Imani Christian’s 80-6 game would be here. But, it is noteworthy this year they were all shutouts. Basically, these are the forgettable games. Games in multi-game events, or places I’ve been numerous times before that to even remember these games in a year or two will be just because I’ve written it down. Aliquippa jumped out to a big halftime lead, and led to a running clock in the second half with 6-minute quarters. Brashear’s win over Carrick was just one of many PCL games I’ve attended. Completely one-sided. Mississinewa was just one of 4 games at Ball State, and one-sided and unremarkable for the day. 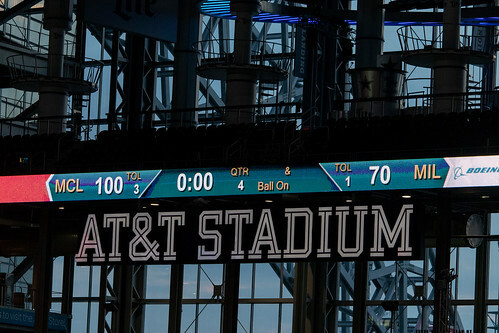 Considering the 70-52 score in the early game made for a great overshadowing. Monroe PCM won the final game of the weekend in Iowa. A drab shutout of what was a good week of football until then. And the Oakland-Whitehaven game was one to look forward to, and then it was as if Whitehaven just couldn’t put it together on the field to score. Weak crowd, on Thursday, in a weekend of game with heavy rain and wind. Now, you might be wondering why I didn’t mark down New York. Also, in case you’re wondering, Peebles is a club team, that aren’t members of OHSAA. And only played two games this past season according to Calpreps. However, Beallsville IS a member of the OHSAA. In years past, it’s almost always been a team from the southwest or western plains that gets labeled as ‘worst’ team by calpreps rankings. A combination of lower regarded states and just being the worst one there. So, it’s a bit of a shock to see a New York City school be labeled the worst. This was the seventh straight year seeing games closer to home. Though, I did see a lot more in New York than I originally planned. My wife’s work precluded her from attending most of the games this year. And some that she could, I was doing photography so she didn’t want to sit alone in the stands. Also, some of the longer trips were split with my friend. Despite the high number of games attended, I did get a few new places. North Carolina, Tennessee, and New York state finals. Even if I’d been to the Carrier Dome several times in the past. During the regular season, I saw games at new places all season long. And a lot of driving. Four years ago, to see 127 games, we drove 21,190 miles. Last year, it was 15,780. However, this year the total for all miles to all games was 18,493 total miles. I didn’t keep track of gas mileage for the entire season. I mostly drove my car, but sometimes took my wife’s car and for some of the longer trips, carpooled with a friend. Though, my car generally got about 25-28mpg. Total cost for gas was $556.78. As I’ve said before, my wife and I get free gas through her employer, so only when we venture far from home do we have to pay for gas. For tickets, programs, souvenirs, and parking total $464 for the high school games. And I also attended three Browns games, including on one Thursday in lieu of a HS game. Most of the single games were sideline work this season. So, tickets and parking were mostly for the major events: Tennessee, Iowa, North Carolina and Texas. Programs were just whenever throughout the season. If not included. All tolled, I spent $4812.90 to attend the 118 games this season. That equalled $40.79 per game. However, the numbers are skewed by three Browns games travel. As in the past, it’s hard to divorce those costs and mileage from the other games. Trips this season were much different than in the past few years. My wife’s school schedule had caught up with her, and taking some leisure time proved impossible. Also, a one-year-old is much easier to entertain and monitor than a two-year-old. So, for the season basically opted to stay home, aside from the Browns games. So, with photographing games, also, it was on my own for most of the year. Except for some of the longer trips I split costs and went with a friend. It wasn’t that I couldn’t go myself, but if someone else plans or is willing to go to the exact same stadium to see the exact same games, why not cut costs and carpool? Those included Week 0 with the trip to Chattanooga and the two bowls in Kentucky. Having already seen a game at Finley Stadium in Chattanooga, I wasn’t exactly looking forward to the doubleheader. I’d have rather seen a single game somewhere closer to Chattanooga. However, it was a compromise for the trip with a friend. Torrential rain and a really long delay for lightning dampened the mood of the stadium. As it still stayed Chattanooga’s usual mid-August temperature. The second noteworthy trip, was to Indiana. The day after a short one-day drive to Maryland. I went alone, as logistics didn’t allow carpooling, but still met up in Muncie for the Friday and Saturday games. During the regular season, I made a lot more trips to New York than I had anticipated. A few times, it was due to the weather being uncooperative. And sometimes just because New York has a tendency for odd game days. Consolation games sometimes played on Wednesday or Thursday. There was a Monday game due to a storm. And a plethora of Saturday options due to shortages of officials means a lot of new ‘unusual’ locations for Saturday night games besides fields that are unlit. Week 12, though, was another road trip to Iowa, shared with my friend. I originally wasn’t really that interested in going. But, half the cost is a great incentive. 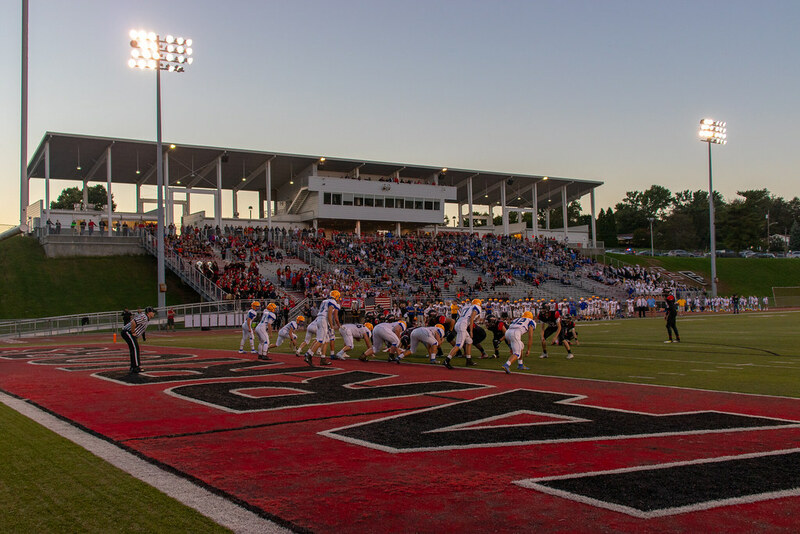 Week 15, again, was a road trip to Tennessee to see what would be 8 of the 9 state finals. The weather was a nuisance and I wouldn’t mind making a return trip if the weather looked better one year. Tickets, hotels, and parking were all cheap. And it’s not that long of a drive to Cookeville. And lastly, was the dual-weekend of North Carolina and Texas. North Carolina only being thrown in at the last minute. Georgia was another possibility with their games being moved to midweek after the MLS Cup setup shop at Mercedes-Benz Stadium the previous Saturday. However, the North Carolina/Texas trip was done fairly cheap. I had one free hotel, one comped hotel, slept in the car three nights, and carpooling with a friend from the hotel to the stadium meant I didn’t pay for parking at AT&T Stadium since he was covering the game. Also then got free program, as well. Only $60 for the tickets and whatever food. The $12 Brisket Nachos are the must have and work well for the mid-day meal. 2018 was an interesting year. I wanted to take the opportunity to see games in as many new places as I could. However, the playoff portion of the schedule was mostly familiar places. Week 15 was the major change. A friend and I carpooled to Tennessee for their originally scheduled 9 championship game. Of which, we saw eight. Since the last game on Saturday night was postponed due to lightning to Sunday afternoon. Also, due to hurricane season, the North Carolina title games were pushed back to Week 16. The rest of the trips were to New York Section 6 Finals (Week 11), Iowa State Semifinals (Week 12), WPIAL Finals (Week 13), New York State Finals (Week 14), Pennsylvania State Finals (Week 16), and Texas State Finals (Week 18). Though it was my first time seeing the New York State Finals, it wasn’t my first time seeing games at the Carrier Dome. 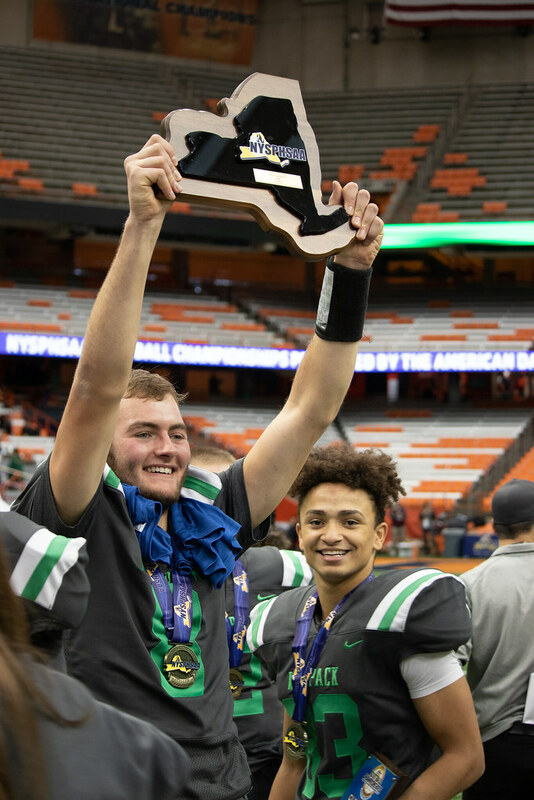 Syracuse regularly hosts a Kickoff Classic at the Carrier Dome for Section 3, as well as the Section 3 Finals later in the year. This was the year of the monsoon. It rained so often at games, that it became a weekly ritual. It didn’t phase me, then, when I realized North Carolina was playing their finals the open weekend between the PA and Texas finals that, they too, would be in the rain. 30 of the 118 games had rain. And 8 games were shifted or rescheduled or had me change plans to avoid the rain entirely. After last year’s beautiful weather, this year didn’t cooperate. I saw my first 99-yard touchdown run. In one of the last games of the year, by Shadow Creek’s QB taking a deep snap in his own endzone and snaking his way through the defense for the touchdown. I saw 119 new teams and saw games in 38 new stadiums. For the season, I saw 220 different teams play 118 games. In 59 different stadiums in 56 different cities. The 3 games in the same city were (and I go by postcode unless a town/borough/city is incorporated), Greenville (Snyder-Stone Stadium and Reynolds Stadium), Muncie (Delta Football Stadium and Ball State’s Scheumann Stadium), and Pittsburgh (Cupples Stadium and Heinz Field). I’m now up to 1,061 different teams. 300 different stadiums. And 270 different cities. And currently, at 940 games. I should hit 1,000 high school football games sometime near the end of the 2019 regular season or early playoffs. This stadium didn’t have much to offer. But the view was incredible. Situated in a stark valley sandwiched between a river and railroad/highway, the mountains dominated the landscape. The stadium itself was small, resourceful, and nice and adequate enough for the crowds that attended. Concessions and restrooms were to a small building at the south endzone, blocking part of the view of the school. I’m adding this one just because of the unique way they built the stadium into the hillside behind the high school. Rather than pour concrete, or build a concrete stand, what they did was drive pilings into the ground. And secured what were essentially guard rails to them. Then, layered with dirt and covered in rock to create a terrace-like structure. Atop the pilings, were mounted the metal bleachers. The seats had incredible leg room, and not being on either concrete, metal, or wood was something I can’t say I’ve ever seen before for a stadium that can be qualified as a ‘stadium’. This massive stadium lacks in parking what it makes up for in structure. Fully roofed, the huge stadium dwarfs the crowd but creates an echo chamber to amplify the noise. It’s been kept up over the years and isn’t showing the signs of aging you’d expect for such an old edifice. 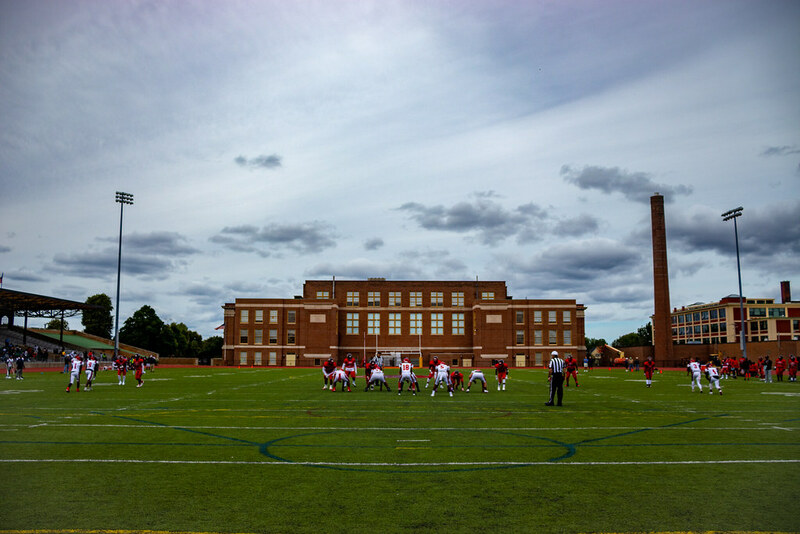 The school towering over the west endzone adds to the appeal. Though, nothing except the scoreboard across the field at the 50 dampens the view as a fan. This was a shock. I originally planned to see the Canon-McMillan at Peters Twp game, but after the end of the City League game between Westinghouse and Brashear, decided we had the time to make it to Elizabeth for the Elizabeth Forward-Derry game. And the stadium, though lacking for quality lighting, makes up for it in sheer presence when staring up at it from the field. This year has been a bit different than past years. Despite some longer trips, it was much more ‘getting there and back’ in most cases. Which meant for a little less intrigue in terms of travel stops. This place was cheap. But the room itself felt like something out of the late 80s or early 90s. Including the old tube television. The one entire wall was mirrored. And was incredibly cramped. And finding open outlets was near impossible. I stay at these as often as possible. In North Carolina, one of my free rooms was a stay at one near Raleigh. Like a studio apartment, complete with kitchen, couches, two beds, etc. Shame I was only at that one for a night. Was here by chance. I had gone with the Motel 6, only to discover on arrival that they only accepted cash. So, Hotels.com found me another room, at a much higher quality hotel, and charged me the cheaper rate. Not a huge concern. But, it was a good room in a better location. There’s always something interesting somewhere. I’ve never understood the fascination western New York has with “Texas Hot Lunch” or “red hots” or any other moniker they give to basically having “chili dogs”, but Louies’ not far from New Era Field has some of the best. Get them with mustard, onion, and chili, and you’ve got a meal. Burger there isn’t half bad, either. Stopped hear between games at Summit Academy and Cameron County. A bit expensive, but they had all you can eat ribs and wings for about $18. 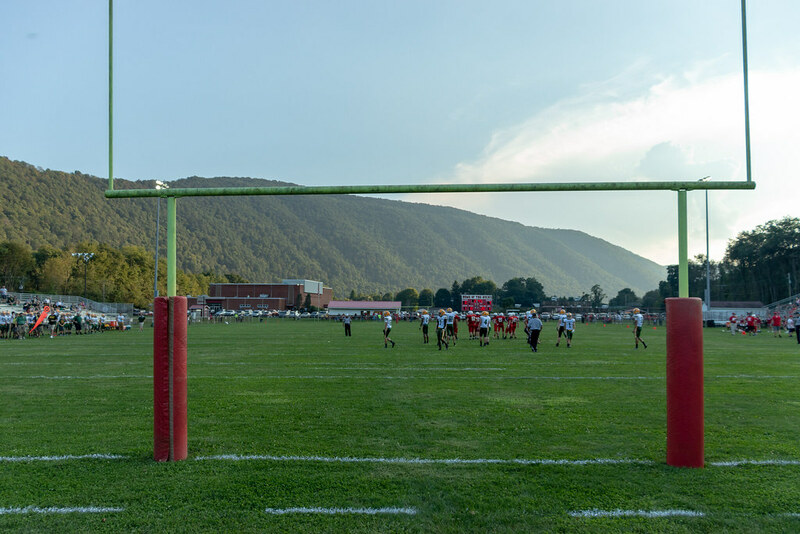 I’ve stopped back again when I went to Renovo for the Bucktail-Nativity BVM game. I found this place by my hotel in Amherst for the Section 6 finals. All you can eat sushi for about $12 for lunch isn’t bad. It’s about $20 for dinner. There’s a lot more available. Including lobster claws, crab legs, various seafoods and assorted chinese and japanese staples. The sashimi and nigiri are the best, though. This place was good for lunch. No steak on the buffet for lunch. However, their standard American fare buffet style included salad, burgers, mac-n-cheese, and about what else you can picture. The chicken was well worth it alone. I’m sure steak for here would be good as well since everything else failed to disappoint. This place had exceptional ribs. And be warned, their serving sizes are huge. Making the mistake of getting pulled pork AND ribs nearly ended me. The rib is the full rib including all the tip. They’re not trimmed bare like most other places would. It’s a casino buffet. Ribs and chicken for about $20 all you can eat. Add in all the deserts and general fare they have. And it’s not a place to be trifled with. I also won a few hundred dollars there. So, it gets on the list. Stopped here with a couple friends the night before the UIL Finals started. The Ranchiladas was basically enchiladas, but with an 8 oz steak (I think flank, but not sure) added in place of an enchilada. Very good. Decent price. This was my first time at Texas de Brazil. I’ve been there a few times since. It’s pricy. But the food is good. Served brazilian steakhouse style with the meat arriving on swords to your table. The Picanha, lamb chops, and filet are the best of the bunch. And it’s hard to not emphasize their soup and salad. The paper thin sliced pineapples and salmon for your salads. Plus, the lobster bisque. All in a all a great meal. If a bit pricy. Culver’s, Freddy’s, and Cookout are three must-stop type burger joints whenever I travel. Also, is Krystal which I think is a better slider than White Castle. For chicken, Lee’s Chicken primarily in Kentucky is a great stop compared to some of the other chains, and superior to KFC. Church’s chicken is okay, and Popeyes is overcooked by comparison and not really worth it. HuHot is a great ‘all-you-can-eat Mongolian grill’ option, and a regular stop when I’ve been to Cedar Falls, Iowa for football games. There’s other locations around the country that I’ve stopped at and haven’t been disappointed. I love Indian food. It’s a staple at my house. I make it myself. Out on my travels, I’ll stop anywhere with a highly regarded Indian buffet. Traveling with my friend, though, limited my options this past year since he’s not so much a fan. Mediterranean, middle east, Thai, Korean, Vietnamese, Cambodian, and Indonesian foods aren’t passed up by me, either. A good Mediterranean place I stop at regularly, but not during football because it never lined up, is Ceedo’s Eatery in Stow. Great stuffed grape leaves and lamb chops. However, for Indian food, a few stops along the way include Taj India in Birmingham, Alabama. One of the rare times you see Chicken Korma as their ‘primary’ chicken dish. And it was good. You rarely ever see Korma as an option on an Indian buffet. It’s usually either curry, makhani, or tikka masala. Which have varying ranges of flavor. Tikka Masala is overplayed, honestly. Nirvana Kitchen in Harrisburg, Pennsylvania has some incredibly good Tandoori Chicken. Their chicken dish is tikka masala the day I was there this season. It was good. But I still loved their Chicken Curry they had one day last year. And lastly, Bombay House in suburban Memphis was a drab affair in an overly crowded strip mall. Food was decent. Price was okay. But, could be better. As in previous years, I have favorite moments of the season. Not just games or plays. Not just seeing new stadiums. Sometimes, it’s just brief moments in time that seem to slip away and you don’t know they were there until they were gone. As I said previously, 2018 is the year of the rain. From the very first game in Tennessee resulting in an extended lightning delay and an accompanying monsoon. And the heat. The unbearable, oppressive heat. The rain didn’t help it. Instead, huddled under the stadium to stay dry just meant more warm bodies and little airflow to keep cool. 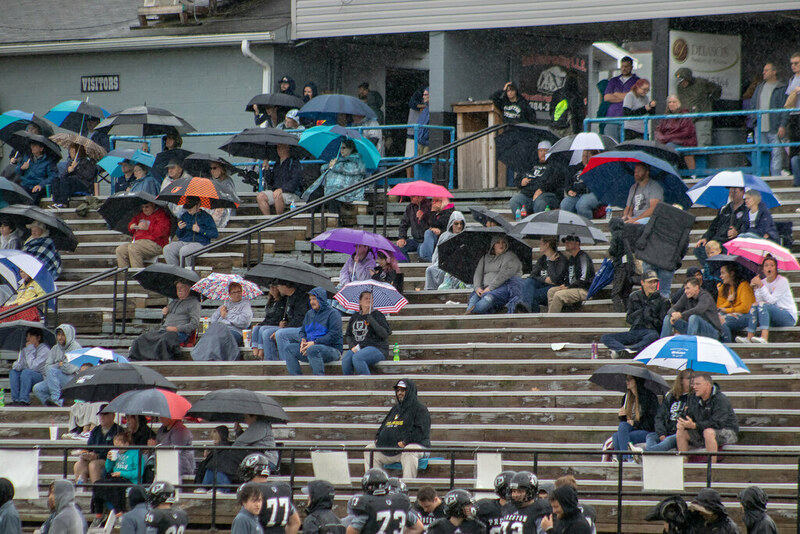 The weather-rescheduled games and the monsoon that hit the Reynolds-Maplewood game (and the rain during the playoff rematch). The Tennessee title games in the rain and severe winds. The last game being postponed due to the lightning. Huddled under not one, but two different stadiums in North Carolina for three state title games. It was just unreal. What can you say about this one? After last year’s unbelievable finish between Manvel and Highland Park, Texas did it once again. An incredible finish culminating with a hail mary as time expires. The roar of the North Shore side, the side I sat on, was deafening. And pandemonium. It was purely by chance. Honestly. I had been searching around for Saturday games in the future, and knew that, at some point, I was going to Panama, New York for a Saturday afternoon game and following it with a night game in Duke Center, Pennsylvania between Otto-Eldred and Curwensville. But, with the weather (see #1), the Corry-Titusville game was moved to Saturday afternoon. And several other games were pushed back as well. Including Chautauqua Lake/Westfield and Randolph/Frewsburg. On the short drive between them, I went through the small town of Clymer and saw their stadium, and then drove up past Sherman, and saw their stadium. If you could call it that. I took a photo and posted to twitter and didn’t think much of it. Just remarking that I’d be seeing the team that calls this one of their homes in the future. And I did. It wasn’t that competitive, but (under the threat of rain), saw CSP host Salamanca on Saturday afternoon a few weeks later. And it was fun. 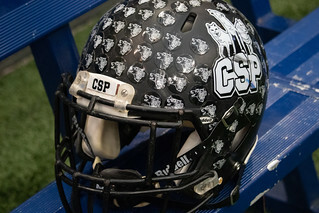 So, when I went to New Era Field for the Section 6 finals, it was with a bit of a kismet to be seeing CSP there again. I had seen other teams before. Maple Grove had played a Monday night game. I’d seen Cheektowaga, WSW, WSE, Bennett/Olmsted, Southwestern and Cleveland Hill previously. But, CSP was a fun team to root for and seeing them get their first Section title as a combined team was fun. It made my Week 14 plans that much easier. In the past, NYSPHSAA State Finals were usually held on Friday and Sunday with Saturday being open for Syracuse football. Not this year. Instead, they were on Friday and Saturday and despite my initial plans to join a friend in Indianapolis for the IHSAA Finals, I decided to go see my first New York State Finals, including CSP going for their first title against Moriah. So, that’s what I did. It was a blast watching a team through the year advance to, and win their state championship. I’ll definitely be back next year for a game at either Clymer or Sherman. And maybe finangle a road game in there if Salamanca works out since that’s also on my list of places to see. For PA Football News, I cover a lot of games now. Planning to attend the four games on a Saturday at Ball State was on our list with my friend. And was a bit surprised how simple and open they were to having us cover the games. Then, the plan was to find a game for Friday night and found Delta High School northeast of town. The Delta Eagles boosters and fans were quite happy and welcoming of someone covering their games. And the atmosphere and crowd there were incredible. But it didn’t end there. On Saturday at Ball State, the media director for the school quite enthusiastically welcomed us to the stadium and had free reign to photograph the sidelines and have spots in the press box. The lack of other press for their games was surprising. To think we thought we might be a burden or there wouldn’t be enough room for us. Muncie is definitely on the list for next year. Seeing a lot of games means seeing a lot of sunsets. And yes, a lot of them can be picturesque. But, I don’t think anything will top my Saturday evening in Mayville for the Chautauqua Lake/Westfield-Randolph/Frewsburg game. Given its location, and the heavy cloud cover, meant that the setting sun hit the clear and open Lake Erie, reflecting up and illuminating the underside of the clouds. It wasn’t the most competitive game. It wasn’t a game that years from now and anybody would really remember the score or a particular play. But, it will always been remembered for the mud. Ferndale v. Purchase Line. 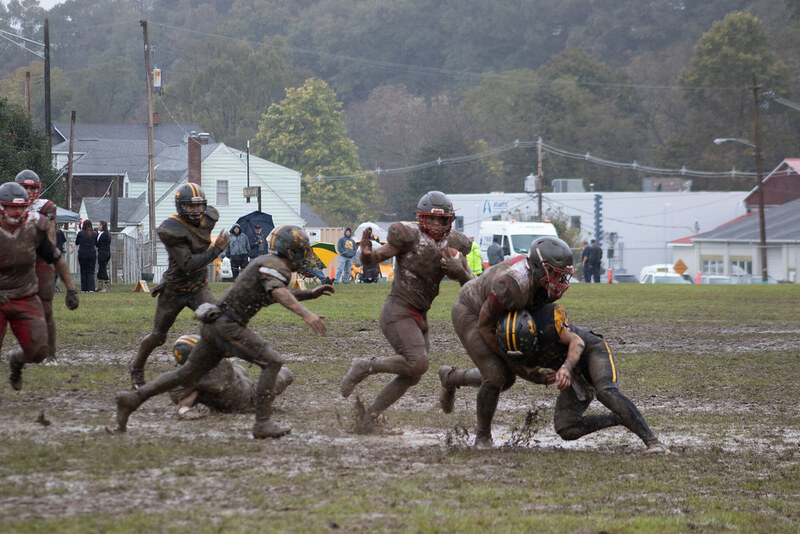 In the mud at Ferndale Stadium. This quaint, baseball/football hybrid of a field. Inundated by rain. The entire surface turning into something unstable. But, oh, was it fun to watch. And by the looks of it, the kids playing were having fun. Win or lose. So, a lot of 2018 didn’t go as planned. Some changes were for the better. And some were just because. My wife’s work and class schedule made her travel near impossible. But, luckily a lot of games I had a friend either carpool with or met there at a particular game. So, 2019 has a bit of unknown. My wife is one semester away from graduating college. And it looks like football games with her will be minimal at best. After seeing 127 games one year, I made it a goal to see as many games in new places as I could. And for the most part that was true of 2018. But, a lot were in the same places again. UNI-Dome, AT&T Stadium, Carrier Dome, New Era Field, Heinz Field, and Hershey. Regular season games were all over the place. So, for 2019 it’s going to be a bit of both. I intend to finally see games at Mercedes-Benz Stadium in Atlanta. The Corky Kell Classic already has five games scheduled for Saturday of Week 0. And I intend to be there. It means giving up on Kentucky games, most likely. Though, they’re always a fall back option. With PA not bumping their titles back a week like every other state at this time, PA and OH finish on the same weekend in 2019. Which gives an open weekend and the GHSA finals should be in Atlanta that weekend. Which may be what I do. The regular season will again be a trip to new places. Both on Saturdays and the regular Friday night games. There’s still a lot of District 10 I haven’t seen and would like to take in as many new places as I can. New York, still has a lot of Saturday options. For the playoffs, it looks like a bit of a repeat. Week 11 will be New York. Week 12 will be Iowa. Week 13 will be Heinz Field, Week 14 will be Indiana or New York, and Week 15 will be one of Pennsylvania, Ohio, or Kentucky. Week 17 will be Texas rather than Week 18. Plans are subject to change, however. I’d like to find the ability to wind up in New England states at some point. But, who knows when. Vermont and New Hampshire only do 3 games all in one location each. Maine has two locations for 4 titles. Only one in Orono, and the other three in Portland. Massachusetts now does 8 (2 on Friday and 6 on Saturday) at Gillette Stadium. However, they utilize 10 minute quarters to fit in those six games. And Rhode Island has four games over two days at one site. And Connecticut plays all their games on one day at several different sites but play well into December. So, the options are limited now for ‘new’ playoff sites. Having seen titles or playoff events in Minnesota, Wisconsin, Iowa, Nebraska, South Dakota, Illinois, Indiana, Michigan, Ohio, Pennsylvania, New York, New Jersey, Maryland, Delaware, West Virginia, Tennessee, North Carolina, Georgia, Florida, Louisiana, Texas, and Utah, there isn’t much left out there that’s feasible. So, most of the ‘new’ places will be regular season games. Still on my bucket list games in Kansas and Arkansas. And at some point see the Rocky Mountain Rumble in Pocatello, Idaho or the Jayton Gridiron Classic in Jayton, Texas. But, for now those are at least another year away. I still have Washington, Oregon, Idaho, Nevada, Arizona, Kansas, Arkansas, D.C., Connecticut, Rhode Island, Vermont, New Hampshire, Maine, Alaska and Hawaii to see games in. The northeast, at some point, will probably be a regular season weekend of Thursday, Friday and Saturday taking in a game in each state somewhere. At least as just an option. But, those plans aren’t really that interesting at the moment. But not next year. 2019 will mostly be a chance to see some new places in and around Pennsylvania and Ohio. But, wherever I go, I’m sure it’s going to be fun.